The Belling plug has served us well since the earliest days of television, but nowadays the ‘f’ plug is coming into common use. 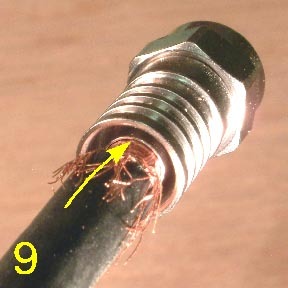 There is no sign that the aerial socket on the back of your TV set or VCR will ever be an ‘f’ type, but satellite dish connections invariably are. The interconnects on distribution systems are now usually ‘f’ types. 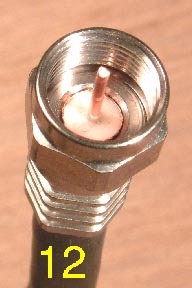 Not so long ago it was considered acceptable to use C55-type (read cheapo) coax for UHF aerial downleads, with CT100-type cables being reserved for satellite use. Since the advent of terrestrial digital television CT100 types have become the norm for pretty well everything. We have standardised on Cavel QF100 cable, supplied by ACE of Cheltenham (01242 580688). This cable is similar to CT100 but has a foam, rather than semi-airspaced dielectric, and seems to be a good, durable product. 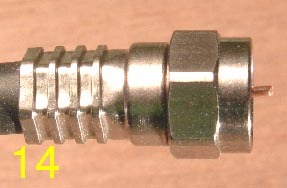 It is possible to use twist-on or crimp ‘f’ plugs to terminate QF100. 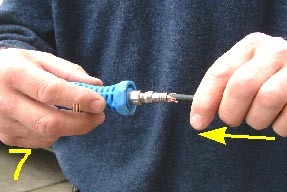 This page will show you how to fit a crimp plug quickly and easily. The result is a good secure fitting. The cable, plugs, and tools are all available from ACE. That’s a drink you owe me, Richard! 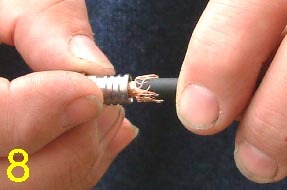 Clip the stripping tool over the cable, leaving about 1mm of cable protruding. Turn the tool two or three times. 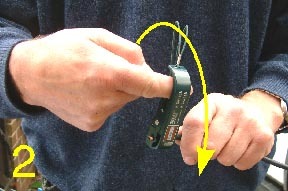 Without opening the tool pull it off the cable. The result should look like this. 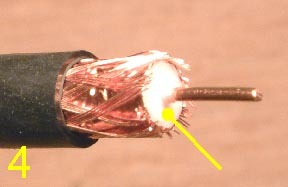 Remove any stray strands of braid on the white insulation, as indicated by the yellow pointer. Turn back the braid. This can be done with a small screwdriver, or just use your fingers. Leave the copper tape in place. 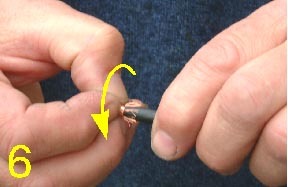 To help the copper tape slip into the ferrule of the plug, it might help to run your fingers round it to smooth it. 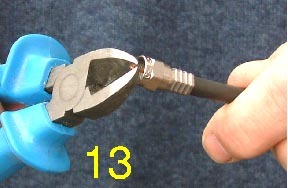 Screw the plug unto the insertion tool, and push the plug onto the cable. You might decide not to use the insertion tool. 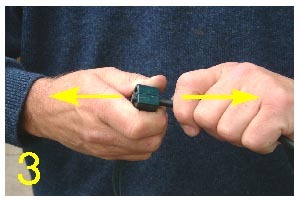 The plug will go on quite easily by hand. 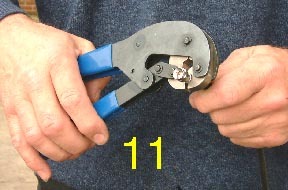 Grip the rear of the plug body in the crimp tool. The plug should be crimped but not crushed. With a correctly adjusted tool this will happen automatically. Check carefully for any stray strands of braid on the white insulation. They could short-circuit the inner conductor to ground. 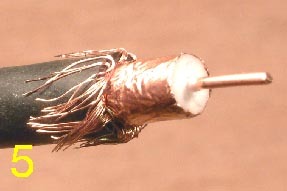 Trim the inner conductor if necessary so that it protrudes about 1mm. 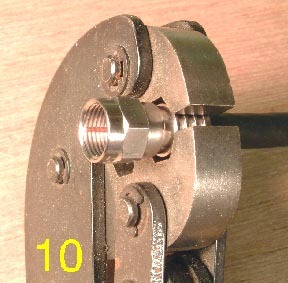 Note that more than 2mm can short out in the socket. 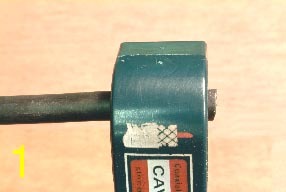 If you have to screw a lot of ‘f’ plugs onto multi-way splitters, where the sockets are close together, here’s a tip: Take a good quality 11mm spanner and grind or cut it down so that it fits in between the plugs more easily.